Recently I was speaking with a potential convert who grew up with no religion. What he was really struggling with was, what do I need religion for at all? Can’t I just be a good person? I’ve heard this question from many Jews and certainly many students over the years: why do I need to come to temple, or Sunday school? Isn’t it good enough to be a good person? And for the most part it is. To my Jewish students it’s easy to say, of course being a good person is important, but you are a Jew, and that includes a history, and religious traditions which have nothing to do with ethical behavior, so to continue the Jewish people you need to know about these things and continue to teach them. But to a non-Jew this, of course, was not a true statement. So, why be Jewish, or why have religion at all? It is completely his choice, and his to grow faith in, or not. We came to a discussion on “Ethical Monotheism”: when I was growing up, this was a very popular description for the Judaism my religious school was interested in teaching. It wasn’t that we ignored the Jewish traditions which were not related to ethics, but we so prioritized doing good that the word mitzvah became translated as “good deed” instead of “commandment/obligation”. We focused so much on the mitzvot which were good deeds there was hardly time to discuss relationship with God, or what God might ask of us which has nothing to do with good deeds (like prayer, Shabbat worship, Passover observance, and so many other practices). But the problem with ethical monotheism is, “why be Jewish?” It was all very well and good for synagogues to teach people to be good and ethical; I don’t think any of the parents complained about that. But what we have learned is that just being good people isn’t a very compelling answer to “why be Jewish?” generation after generation. People need more connection with God, and community and “spirituality” and “tradition” to feel connected to Judaism in a way which connected their children as well. We might be happy to raise a generation or two of ethical, good people, but most of us who choose to be part of a temple community are disappointed to hear that the younger generation isn’t interested in joining temples, or that they feel disenfranchised by organized religion in general. I think this is directly related to not having emphasized the other aspects of Judaism, connection to God and community: mitzvot which don’t directly make the world better but might help make us more connected to God, more interested in the Jewish. It was only really in thinking about it from an outsider’s perspective that I was able to even ask the right questions. Yes, it is absolutely possible to be a good and ethical person outside the confines of religion; you don’t need the Bible or any other religious book to be taught morals and proper behavior in the world. And surely we can all think of examples of supposed religious leaders who were truly unethical or even rotten human beings, in spite of all the religion and Bible they quoted. (There can be rotten apples in every bunch). So why, as someone who never even considered that there might be a God, who was raised with no religious concept, only with moral behaviors based on his parents’ teachings and societal norms, why should this person consider the existence of God and committing to the Jewish people? What I believe, and what I think might be compelling to those inside the faith as well, is this: It is possible to be an ethical, moral person on your own, especially with the black and white questions in life. But religion and especially religious communities serve to help us when we struggle in the grey. When we are not at all sure which choice is the right choice or even a good choice, if we have an existing relationship with God we can turn to prayer and God to help guide us. If we have a religious leader, like a rabbi or cantor, we can turn to them to discuss the possible choices and outcomes, and do so in confidence. We can turn to our community for support, in choosing right instead of the social pressure that a work or school community may be putting on us to choose the easy or lucrative path. And so too, we can turn to these communities when, having made the difficult choices, we may be dealing with personal consequences. 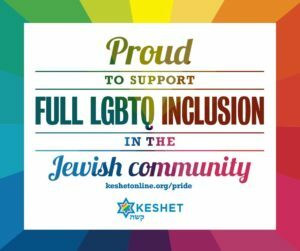 So why be Jewish? There are so many compelling reasons to be Jewish, from the good works that Judaism inspires you to do, to the community that it created. From the strength that a personal relationship with God can give you during times of difficulty and times of joy, to the wonderful memories and life fulfillment created by following in our traditions. I hope the questions brought to you from an outsider can help you better see your place in and relationship to the Jewish world, and maybe inspire you to connect more, or connect again, to something that we as a community offer to enrich your life.